Posted by Dave Emory ⋅ February 9, 2010Post a comment Email This Post Print This Post Tweet This! Beginning with the topic of the Oklahoma City bombing in 1995, the program notes that video tapes of the bombing have been edited. Attorney Jesse Trentadue obtained the tapes while investigating the Oklahoma City bombing, in order to clarify the circumstances surrounding his brother’s death. Ruled a suicide, Trentadue’s death may well have resulted from his resemblance to the mysterious John Doe #2, seen in the company of convicted Oklahoma City bomber Timothy McVeigh. Although Trentadue’s injuries suggest he was murdered, prison authorities and other forensic investigators have gone to great lengths to dissemble about the cause of death, a pretense made more effective by the prison “suicides” of several people connected to the case. Next the broadcast turns to the subject of Norm Olson. Formerly of the Michigan Militia and another of Oklahoma City bomber Timothy McVeigh’s mentors, Norm Olson has relocated to Alaska, home of Sarah Palin. Next, the program highlights Sarah Palin’s association with longtime GOP operative Fred Malek. Associated with the Carlyle Group, Malek achieved notoriety in the 1970’s by purging the Bureau of Labor Statistics of Jews, because Richard Nixon felt that high unemployment statistics were due to a “Jewish conspiracy” against him. Turning to events abroad, the president of Chechnya has [correctly] identified elements of the “West” as behind attempts to fragment Russia. Even though elements like the UNPO champion the independence of groups seeking to fragment the United States, elements of the American political and corporate establishment are working to effect the independence of ethnic groups in the fossil-fuel-rich Caucasus. A very important article notes German dissatisfaction with U.S./Chinese relations and attempts at de-stabilizing China. Fearing that the U.S./China relationship will eclipse its relationship with America, Germany is supporting elements seeking to fracture the People’s Republic, including the Tibetans and the Uighurs. China was demonized in the West following the climate change summit in Copenhagen. What did not receive much notice was the fact that the European Parliament was represented at the talks by Nick Griffin, head of the BNP, the leading British fascist party! The program concludes with an ominous assessment of the present economic destruction afflicting the United States and a hopeful analysis of what might be done in the future. Program Highlights Include: Review of Andreas Strassmeier’s mentoring of Timothy McVeigh; review of Strassmeier’s connections to Helmut Kohl’s administration in Germany; review of links between the Oklahoma City Bombing; review of Sarah Palin’s links to the Alaskan Independence Party; review of the AIP’s links to the Aryan Nations; review of Fred Malek’s links to the Nazi wing of the Republican Party; review of the fascist, Nazi and intelligence connections of the Dalai Lama; review of the link between the Uighurs, elements of Western intelligence and the Underground Reich; review of the monstrous society that preceded the Chinese occupation of Tibet; review of the Anti-Bolsevik Bloc of Nations and the destabilization of the USSR. 1. Beginning with the topic of the Oklahoma City bombing in 1995, the program notes that video tapes of the bombing have been edited. Attorney Jesse Trentadue obtained the tapes while investigating the Oklahoma City bombing, in order to clarify the circumstances surrounding his brother’s death. Ruled a suicide, Trentadue’s death may well have resulted from his resemblance to the mysterious John Doe #2, seen in the company of convicted Oklahoma City bomber Timothy McVeigh. Although Trentadue’s injuries suggest he was murdered, prison authorities and other forensic investigators have gone to great lengths to dissemble about the cause of death, a pretense made more effective by the prison “suicides” of several people connected to the case. In past discussion of the bombing, we have seen the evidence pointing in the direction of Andreas Strassmeier as Timothy McVeigh’s mentor in the bombing. Accused in unimpeached testimony by ATF informant Carol Howe of being the mastermind of the attack, Strassmeier is the son of Gunther Strassmeier, former German chancellor Helmut Kohl’s chief of staff, the architect of German reunification, and himself the son of one of the charter members of the German Nazi party under Hitler. 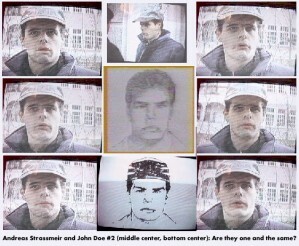 As seen in the picture at the upper right of this description, there is a strong resemblance between the composite sketch of John Doe #2 (seen in the bottom and middle frames of the picture) and Andreas Strassmeier, seen in the other photos. “The real story is what’s missing,” said Jesse Trentadue, a Salt Lake City attorney who obtained the recordings through the federal Freedom of Information Act as part of an unofficial inquiry he is conducting into the April 19, 1995, bombing that killed 168 people and injured hundreds more. “Four cameras in four different locations going blank at basically the same time on the morning of April 19, 1995. There ain’t no such thing as a coincidence,” Trentadue said. “It’s taken a lawsuit and years to get the tapes,” Trentadue said. He was never a bombing suspect, but Jesse Trentadue alleges guards mistook his brother for one and beat him to death during an interrogation. The official cause of Kenneth Trentadue’s death is listed as suicide, but his body had 41 wounds and bruises that Jesse Trentadue believes could have come only from a beating. Jesse Trentadue said he has received about 30 security tapes, including some images that were used as evidence at bomber Timothy McVeigh’s trial. McVeigh was convicted on federal murder and conspiracy charges and executed in 2001. Coconspirator Terry Nichols is serving life in prison on federal and state bombing convictions. “Security Taping of Okla. Bombing Appears Edited” By Tim Talley [AP]; The Providence Journal; 9/28/2009; P. B2. 2. Formerly of the Michigan Militia and another of Oklahoma City bomber Timothy McVeigh’s mentors, Norm Olson has relocated to Alaska. (Olson is pictured at right, wearing the three-corner hat). Past programs have noted Sarah Palin’s significant political relationship with the Alaskan Independence Party (AIP), an openly secessionist, racist correspondent party of the Aryan Nations milieu. In turn, the party belongs to the milieu of the UNPO, the epicenter of a constellation of political entities working to destabilize and fragment larger states such as Russia, China and the United States. Will Olson be working with the AIP? Michigan Militia founder Norman Olson plans to sell his northern Michigan property and move his family and followers to Alaska. Olson intends to sell his 120-acre plot near Alanson and is eyeing 21- and 7-acre parcels on Alaska’s Kenai Peninsula. Olson’s wooded Michigan property long served as a militia training base, where his followers participated in paramilitary exercises. During the early 1990s, Olson emerged as the growing militia movement’s national spokesman, but lost the state commander’s position after the 1995 Oklahoma City bombing. Criticized as too radical by some in the movement, Olson was defeated in four subsequent elections for the Michigan Militia Corps-Wolverine commander post. Olson said he’s leaving for “political, social, economic, religious” reasons and believes complacency has hurt the state’s militia movement. “I’m afraid that over the last four years, the fire’s gone out in the bellies of the patriots,” Olson said. “We no longer shake the guns in the faces of the (bureaucrats and politicians).” . . .
“Michigan Militia Founder Moving to Alaska” by Mike Tyree [AP]; available at: www.rickross.com; 8/26/2002. 3. Next, the program highlights Sarah Palin’s association with longtime GOP operative Fred Malek. Associated with the Carlyle Group, Malek achieved notoriety in the 1970’s by purging the Bureau of Labor Statistics of Jews, because Richard Nixon felt that high unemployment statistics were due to a “Jewish conspiracy” against him. More recently, Malek was a member of the elder George Bush’s campaign, for which he enlisted the assistance of the GOP ethnic outreach group, a Nazi wing of the Republican Party, rooted in the Third Reich. Malek also worked on John McCain’s campaign in 2008. Now, Malek is pimping Palin off to the beltway establishment. ” . . . The person who has been introducing Palin into the more exalted social and political circles of the capital, and who has already arranged her appearance at the Alfalfa Club, is Fred Malek. Two things about Malek are worth bearing in mind. Because the second thing to note about Malek is that he was the man who drew up a list of Jews to be fired from the civil service under the Nixon administration. I am surprised that so many people have allowed themselves to forget this—and that Palin has never been asked a single question about it. In the early 1970s, Nixon, whose White House tapes show consistent evidence of anti-Semitic paranoia, gave orders that the Bureau of Labor Statistics be purged of what he called a “Jewish cabal.” The job of drawing up the list was given to Malek, whose information led to what was called the “reassignment” of some officials within the Labor Department. Malek later tried to give a weaselly excuse for his conduct, but was caught by my Slate colleague Timothy Noah. It beats me why such a disgusting character is still received in polite circles, except that now at least he’s back doing the sort of task to which he is best-suited. He has found an unscrupulous and uncultured political neophyte who will happily act as a megaphone for any kind of libel and insinuation—Obama’s “palling around with terrorists” was, I suppose, the money shot of the last campaign—and then later revise and extend her remarks. Nasty work if you can get it. Malek, now so near old age, must be pinching himself at his good fortune. “Palin’s Pals” by Christopher Hitchens; slate.com; 12/7/2009. 4. The president of Chechnya has [correctly] identified elements of the “West” as behind attempts to fragment Russia. Even though elements like the UNPO champion the independence of groups seeking to fragment the United States, elements of the American political and corporate establishment are working to effect the independence of ethnic groups in the fossil-fuel-rich Caucasus. Note that Kadyrov identifies (again, correctly) the forces that broke up the Soviet Union and being the forces trying to break up Russia. The Anti-Bolshevik Bloc of Nations, very close to the Gehlen spy organization and the Underground Reich was deeply involved in the destabilization of the former USSR. Ramzan Kadyrov, a 33-year-old former rebel turned Kremlin loyalist, said that last year’s attack by Georgia, which is a US ally, on the pro-Russian rebel region of South Ossetia was part of a Western plot to seize the whole Caucasus region. “If they get control of the Caucasus, you could say they’ll get control of virtually all of Russia, because the Caucasus is our backbone,” Kadyrov said. “The Russian government needs to work out a strategy, it needs to attack,” the Chechen president said. Kadyrov’s father Ahmad was a rebel mufti who switched sides in 1999 with his son at the outbreak of Moscow’s second war in Chechnya. Ahmad became president in 2003 but was killed in a bomb attack the following year. US President Barack Obama has offered to “reset” relations with Russia after a tense period during the presidency of George W. Bush, and Kadyrov said it would be good for Washington if the United States followed more friendly policies towards Russia. Kadyrov made several references to Putin, Russia’s prime minister and its most powerful politician, during the one-hour interview conducted last week but did not mention the Russian president, Dmitrii Medvedev. “Chechen President Says the West Wants to Destroy Russia” by Michael Stott and Olga Petrova; Telegraph.co.uk; 12/21/2009. 5. A very important article notes German dissatisfaction with U.S./Chinese relations and attempts at de-stabilizing China. Fearing that the U.S./China relationship will eclipse its relationship with America, Germany is supporting elements seeking to fracture the People’s Republic, including the Tibetans and the Uighurs. As noted in a number of programs, these same forces are supporting fractious, secessionist elements in the U.S., seeking to destabilize or, eventually (perhaps) fragment it. These Underground-Reich connected elements are well-placed within the United States as well, and are using the United States (or what is left of it) to effect a geo-political agenda that suits German interests. The Tibetan desk at the State Department is headed by Paula Dobriansky, the daughter of Lev Dobriansky, a fascist Ukrainian emigre very close to the Gehlen spy organization and the Underground Reich. EU political strategists are alarmed by US proposals for a closer cooperation between the USA and the People’s Republic of China. According to the EU think tank European Council on Foreign Relations (ECFR) “fears” are revived “within Europe that it could be sidelined in a new world order.” These fears are fomented by proposals by the former US presidential advisor, Zbigniew Brzezinski, for regular informal US-Chinese consultations on important global issues. Brzezinski would like to see this cooperation between Washington and Beijing at the same level as the meetings of the eight most significant industrial nations (“G8”) dubbing it “G2” (“Group of Two”). The apparent global balance of power shift from the Atlantic to the Pacific is heightening the tone in anti-Chinese agitation that has always been quite harsh in Berlin. This agitation found its latest expression in the Xinjiang campaign, the EU’s and Germany’s reaction to the Uyghur massacre of nearly 140 non-Uyghur Chinese. This campaign is directed toward weakening the Chinese rival in its strategically important Western regions, thereby impeding China’s further rise. The current debate is taking place in the context of the People’s Republic of China’s steady advance. China is playing an important role in the struggle against the economic crisis, because it holds “the largest monetary reserves worldwide,” assesses US billionaire George Soros. “China’s decisions will have an affect on the future of the world’s economy to the same extent as President Obama’s.” The People’s Republic of China has become “too powerful too soon.” The German EU think tank, the European Council on Foreign Relations (ECFR), is also pointing to China’s rapidly growing importance: Particularly the USA is financially dependent on China and Chinese support is also needed to influence the Iranian nuclear program. China could not only use its veto power in the UN Security Council, but also its exclusive economic influence to intervene on the ground. And lastly, the Afghan-Pakistani war zone borders on China, therefore necessitating joint action. Because China’s ascension no longer can be ignored, former US President Jimmy Carter’s national security advisor, Zbigniew Brzezinski, had submitted a proposal on the future relationship with China, already last January. In the 1970s, Brzezinski had played a leading role in the rapprochement between China and the USA, striking a serious blow against the Soviet Union. Brzezinski now explains that the fact that the USA today is largely depending on the People’s Republic makes a corresponding institutionalization of the cooperation between the two countries necessary. It no longer suffices, to hold consultations within the framework of larger multinational meetings (“G14”, “G16” or “G20”). The top leaders of both states should “therefore meet informally on a regular schedule for personal in-depth discussions” not only about bilateral issues but about “the world in general.” Borrowing from the example of the conferences of the eight largest industrial countries (“G8”), Brzezinski promotes a “G2” (“Group of Two”). Though very controversial with many opponents inside the USA, Brzezinski’s proposal provoked serious concern in Europe. The former US presidential advisor conceives of the “G2″ as being on a par with US-European and US-Japanese relations. But one can imagine that with China’s rapid growth in influence, the „G2” could, in the long run, play a decisive role. The prospect that the most focal global issues could no longer be regulated at a transatlantic but a transpacific level is setting off alarms in European capitals. The prospect of “G2”, ECFR writes, “revives fears within Europe that it could be sidelined in a new world order that exploits its weakness.” ECFR does not expect an imminent implementation of “G2”. “No one in the Obama administration has yet used the term” and “it is seldom even mentioned” in China. But the basic apprehension is obviously there. Berlin would particularly be hit by Chinese-US consultations. Special methods of German foreign policy always included positioning itself between opposing powers as “mediator” and making deals with one or the other side – a seesaw policy practiced exemplarily in Germany’s relations to Russia and the United States. If the United States and the People’s Republic of China would establish a cooperation framework, Germany could no longer play this role in relation to the coming decades’ two central powers. For years, Berlin has been contemplating this possibility. The German government is therefore particularly interested to thwart regular consultations between Washington and Beijing. The apparent global balance of power shift from the Atlantic to the Pacific has already been heightening the tone in traditional anti-Chinese agitation. This agitation finds its latest expression in the Xinjiang campaign, initiated in the West in the aftermath of the Uyghur massacre of nearly 140 non-Uyghur Chinese. This campaign, blaming the Chinese security forces for the massacre, rather than the Uyghur culprits, is patterned after last year’s Tibet campaign both in being aimed at Beijing and in the use of falsifications and classical propaganda techniques. This campaign is aimed at weakening the Chinese rival in its strategically important Western regions. At the same time it is strengthening anti-Chinese forces in the USA involved in the subversive activities in Xinjiang as well as in Tibet, a coincidental and welcomed contribution toward thwarting special US-Chinese consultations à la “G2”. Please read also Metamorphoses and The Future of “East-Turkestan”. Selbst die antichinesisch orientierte Presse ist gezwungen, die Fälschung angeblicher Beweise für Repressionsmaßnahmen Beijings einzugestehen. Belege bietet etwa: Die falschen Beweise der Rebiya Kadeer; Frankfurter Allgemeine Zeitung 10.07.2009. Obwohl China-Korrespondenten über das Uiguren-Massaker an fast 150 nicht-uigurischen Chinesen informieren – so etwa im heute-journal vom 8. Juli -, wird es in den Medien weitgehend verschwiegen und unter nicht näher definierten “Todesopfern” versteckt, die dann meist auch noch den chinesischen Sicherheitskräften angelastet werden. See also Augenzeuge and Particularly Manipulative. “Fear of Demotion’; german-foreign-policy.com; 7/16/2009. 6. China was demonized in the West following the climate change summit in Copenhagen. What did not receive much notice was the fact that the European Parliament was represented at the talks by Nick Griffin, head of the BNP, the leading British fascist party! This is an act tantamount to the U.S. naming David Duke to represent it at the talks! The extent to which the selection of Griffin may have influenced the outcome of the talks is a subject for speculation. Nick Griffin, the leader of the British National Party, is to represent the European parliament at the UN climate change conference in Copenhagen, which opens next week. Last night politicians and scientists reacted furiously to news that the far-right politician and climate change denier should be attending the summit on behalf of the EU. . . .
“Climate Change Denier Nick Griffin to Represent EU at Copenhagen” by Toby Helm; guardian.co.uk; 11/29/2009. 7. A thoughtful assessment of the current state of affairs in this country was presented by a former Australian financial counselor. It remains to be seen how things ultimately play out, but this analyst’s recommendations are good ones. And the economic reality and probable future are truly frightening. I dare say that everyone between the ages of 25 and death is living with regrets about the past, anxieties about the future or both. The current financial crisis is much like a health crisis in that it has triggered a complex array of responses of mind, body and soul, whereby no one is immune, whether wealthy or poor, single or married, employed or unemployed. Some years ago, when I was still practicing as an accountant, I noticed that people retiring with a lump of money in the bank would gradually go from relative comfort to measured existence. Their adult children in the meantime had become enthralled with the use of debt as a means of leveraging financial outcomes whilst bankrolling their lifestyles largely on capital gains. As for the grandchildren, they were raised with tutors and coaches to enter business schools and law schools, or golfing and tennis academies, whilst being fed and entertained, but not much else. As we all know, the gates to this paradise are now closing. On the other side, where the grass was not so green and decidedly patchy, it became increasingly apparent that the welfare state was to be every individual’s guardian angel from the womb to the tomb. It would attempt to cure all ills through handouts and programs designed to minimise misery but not to maximise and realize potential. This group is now growing largely as a result of job losses. The above descriptions do not of course fully encompass the whole array of familial experiences but are nevertheless indicative of a great many families to one extent or another across the western world. This corrosive financial crisis has exposed both the haves and have-nots to the realities of a badly wounded and badly run financial system which can no longer continue to deliver either capital gains or handouts at a pace commensurate with the populace’s expectations and needs. The drying up of credit completes the shrinkage of consumption. For those in their twilight years, the decimation of their retirement nest egg through a collapsed stock market and miserly rates of interest on their certificates of deposit is especially of concern as there is neither sufficient time for, nor promising enough signs of, a meaningful turnaround. Those in the middle years have regretted much of their past lifestyles and investment choices and are now largely hamstrung as to how to proceed as job loss and capital destruction have left them dazed and often without a home. “What is government doing?” you may ask. First of all one must ask “where has the government been?” The answer is, “where it has always been … in the hands of powerful business interests that this time went too far.” This control of course is nothing new or necessarily bad in the history of mankind. “Powerful,” however, should not preclude “enlightened” and this is what has been missing in the lead up to the downturn and since the downturn. The federal government reminds me of a fire chief who recruits firemen from among a group of arsonists to fight the blaze of the century. The “arsonist” banks have gladly seconded their chosen sons Henry Paulson, Timothy Geithner and Larry Summers (among others) to act as firemen in the service of their nation. It was these banks with their campaign contributions, jobs for the boys and coterie of lobbyists and ratings agencies that enabled either the repeal of safeguards such as the Glass-Steagall Act, or the flagrant abuse of lending policies in the belief that a rising market would conceal and overcome the unsustainable banking and business practices they pursued. To make matters worse, the Madoff Affair also revealed the depth of bureaucratic incompetence even when dealing with a one-man Ponzi Scheme despite numerous warnings from credible and qualified observers. We are now “entertained” by bankers who either exhibit the worst of capitalism when gouging bonuses out of their companies or the best of socialism when they clamor for assistance to save the world from implosion when the banking system is threatened. Alas, no heads have rolled even to appease the plebs for a moment. In spite of such talent, the best that Washington has been able to do is attempt to counterfeit its way out of trouble by making dirt cheap credit available to the banks so as to avoid a systemic collapse. This was fine as a stop-gap measure but unfortunately the trickle-down effect has yet to be seen. I am reminded of an old deceased friend who would say, “charity begins at home and ends at home.” Businesses either do not qualify for borrowings or, if possible, are actually paying down debt. The only suckers to whom lending is continued are marginal home purchasers who are guaranteed by the FHA and subsidized by Washington. These initiatives by way of cash-for-clunkers and tax credits for home buyers are nothing more than a jar of antacid thrown down the mouth of a rumbling volcano. Where Washington has succeeded, though, is in keeping the mood of the populace under some semblance of normality. By extending unemployment benefits, giving food vouchers, massaging statistics and allowing people to remain in their foreclosed homes, it has managed to avoid the images of the Great Depression’s soup kitchens. The reluctance of banks to foreclose on homes in a timely fashion is simply a self serving attempt not to blow the whole show apart given that the FDIC’s ability to insure deposits is predominantly a statement of principal rather than a statement of fact. Why else would the FDIC make a decision to collect three years’ of premiums in one go upfront? The figure of 18.5 million vacant homes is not a statistic. It is the reflection of devastation on an individual, familial and societal level. A largely compliant press in the meantime mesmerizes the mostly catatonic populace. For this reason, the current incongruous phenomenon of both a rising stock market and rising gold price is testament to manipulation of the former and speculation born out of fear for the latter. Both, however, are making pertinent comments about the system as a whole. In view of all this, the almost improbable scenarios painted by Russian academic Igor Panarin of a U.S. collapse and disintegration will become increasingly tenable if unemployment, home foreclosures and bank failures continue. The U.S. population is armed and the increase in the number of vigilante groups has the potential to at least make headlines. The catalyst for a domino effect of events is never seriously expected and the possibility of martial law in the land of the free requires only a solemn-looking president to announce it. Beware, however, as the seemingly catatonic populace starts to rebel. Add to this the recent phenomenon of reverse remittances from south of the U.S. border and you realize that severe dislocations are in the making. Despite all this, the United States has enough natural endowment and historical legacy from which to draw strength in an effort to reshape and reenergize its existing political and economic infrastructure. Its standing in the world may be under challenge but is still a considerable distance from being toppled. In a previous essay on this Web site, “Cascading theft … Compounding misery” (October 21, 2009), I put forward a number of policy initiatives that might assist in turning the current situation around. In this essay, however, I wish to briefly touch upon a further (though not novel) approach with a longer timeline which will give recognition of where the true source of strength for the future lies. In my view, a type of “rigor mortis” has set in for a considerable part of the populace and for large swathes of government policy. Change is almost too difficult, too expensive or too late. For this reason, the federal government must spearhead a new effort to effect generational reinvention through the young. This is America’s (and every nation’s) true asset, true hope and final stand if it is to reverse its ugly decline. For this reason, every young person’s progress from childhood to young adult should not only be measured and tracked, but should also, more importantly, be supported to ensure that children are immunized and given proper health care, counselling and even nutrition at school in tandem with proper exercise. Education must be free and of the highest quality with university entrance not being the province solely of the rich. For those less academically inclined, the latter years of schooling must provide vocational training and opportunities before the current older generations who possess skills are totally buried by the Asian manufacturing tsunami. Any welfare payments to parents must be subject to at least satisfactory attendance at school by their children. If the young are nurtured and simultaneously diverted from drugs and violence, the outcomes in terms of stresses on the justice and medical systems and by extension on the U.S. budget will be phenomenal. The time has come to realize that the systematic brainwashing dressed as entertainment on television and other media has hijacked children and taken charge over their diets and values. As one anonymous author once exclaimed, “television has changed a child from an irresistible force to an immovable object.” Every force that views children as potential consumers or disciples has a 24-7 marketing campaign that parents and schools find difficult to match. Our children, therefore, often find themselves fast-tracking experiences that are perhaps better left for the future (e.g. sexual activity) and possibly never indulged in at all (e.g. drugs). Paths to progress must be clear, attainable and broadly available to all concerned. Governments must ensure a level of remuneration that enables the young worker to live with dignity and to eventually form a family unit and own a home without a mortgage that resembles Atlas’ globe. When these goals are out of the reach of the young, their resort to drugs, violence and unstable relationships is but a knee-jerk reaction borne out of frustration. Above all, governments at all levels must collaborate to ensure that EVERY single young person finishing school is given a job or job experience as a basic right. It has been clearly established particularly in males that their brains do not fully develop until they are about 23. Need I spell out why it is important that regular gainful activity is a necessity in those years? Bear in mind that the proportion of employed youth (aged 16-24) in July was at its lowest point since 1948, when record-keeping was commenced. The figure? Just 51.4%. If subprime mortgages are devastating to the economy, how much more so idle, angry and frustrated youth? Both the United States and other nations must heed the predicament of the young at this point. Their parents and grandparents are carrying great challenges which they may or may not fully overcome. The younger generation cannot be expected to fully experience these scars without some path and hope being made available to them as a counterbalance. How after all can we expect them to grow through circumstances not of their making and then also have them carry the monetary responsibility of caring for their aged parents down the track through taxation? This effort to guide youth requires a conscious partnership between parents, schools and government. Finally, the young must be raised in the spirit of community service in all its various manifestations. We must recognize (whether we are Christian or not) that ethics and morality are instilled at an early age through example rather than at university as an afterthought or in jail as penance. In this context I am also reminded of the words of Christa McAuliffe who said, “I touch the future, I teach.” The reality is that whether we are parents, grandparents or teachers we can all touch the future and in the process we will be healed and touched as well, not only as individuals but also as nations. In closing, I wish to pay tribute to all parents (including my own) and all teachers who have labored or continue to labor for the young in recognition of the fact that the future belongs to them. They already track and keep on track their young charges. America this is your destiny. Peter Souleles, an economics and law graduate, ran a private accounting practice in Sydney, Australia, until retiring in 2000. Views are as of November 24, 2009, and are subject to change based on market conditions and other factors. These views should not be construed as a recommendation for any specific security. “One Generation to Regeneration” by Peter Soules; PrudentBear.com; 11/24/2009.